This little book will motivate and celebrate small kindnesses, big accomplishments, and journaling moments every day of the year. Quotes, prompts, and verses encourage intentional living that includes helping others and making a difference in the world. Journaling lines can be used to respond to the text, list good deeds, or write short prayers. 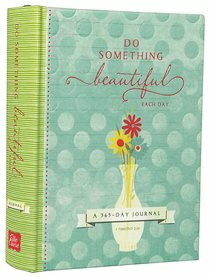 About "Journal: Do Something Beautiful Each Day, a 365 Day Journal"